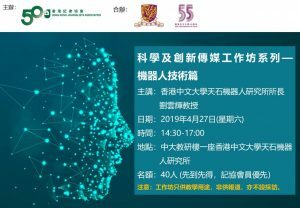 To enhance journalists’ understanding of the recent developments in science and technology, especially in medicine, HKJA is organizing a “Media Workshop series on Science and Innovation” with the support of The Chinese University of Hong Kong. The second media workshop will be on Robotics. The study of robotics is highly interdisciplinary which requires expertise from various fields including Engineering, Medicine and Social Science. Robotics is being considered as the technology that could change the world and human life. Prof. Liu Yunhui, Director of CUHK T Stone Robotics Institute, will introduce in the workshop the development of medical robots, service robots and industrial robots. Participants will have a chance to visit the T Stone Robotics Institute and get first-hand information about the latest research and development of robotics technology in Hong Kong. 1. The workshop is for educational purpose only, not to be reported. 2. First-come-first- served. Priority will be given to HKJA member. We will email to applicants if your reservation is successful.